Heat oven to 350°F. Spray 13x9-inch (3-quart) glass baking dish with cooking spray. In 10-inch skillet, melt butter over medium-high heat. Add bell pepper and onion stir-fry; cook 3 to 5 minutes, stirring occasionally, just until tender. Stir in water, 1/2 teaspoon of the sage and 1/4 teaspoon of the seasoned salt. Heat to boiling. Stir in stuffing mix and 1 tablespoon of the syrup until moistened. Remove from heat. Cut pocket in each pork chop, cutting into side towards bone. Spoon about 1/2 cup cornbread mixture into each chop, pressing in firmly. 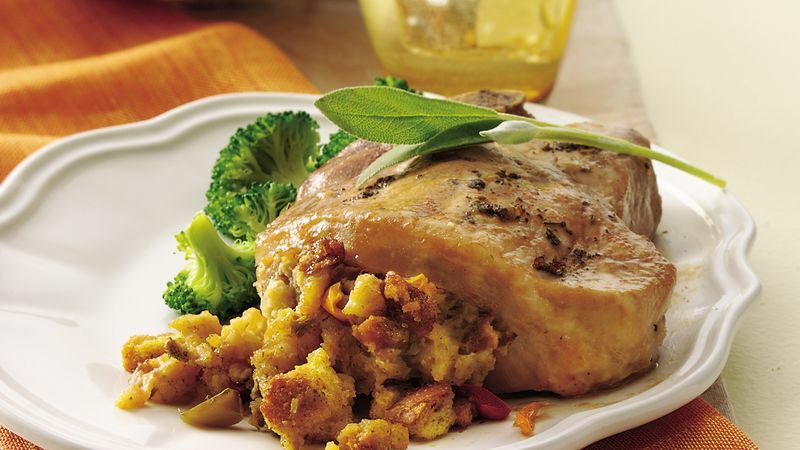 Sprinkle both sides of stuffed pork chops with remaining 1/2 teaspoon sage and 1/2 teaspoon seasoned salt; place in baking dish. Drizzle remaining 2 tablespoons syrup over chops. Spoon any remaining stuffing around chops. Cover tightly with foil; bake 45 minutes. Uncover dish; bake 10 minutes longer or until meat thermometer inserted in pork next to bone reads 160°F. If desired, serve with pan drippings. The chops can be stuffed ahead and refrigerated up to 8 hours in advance. When it's time to get dinner ready, bake them as directed in the recipe, adding a little additional time, if necessary.